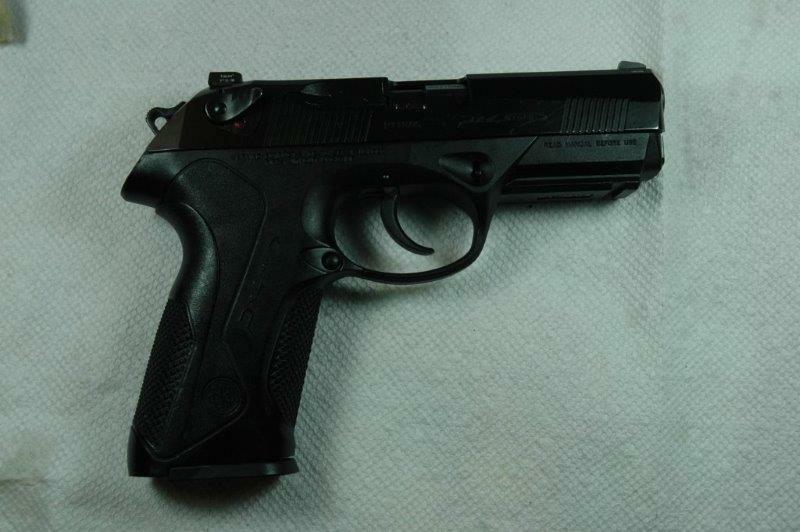 Beretta PX4 Storm is an unlikely member of my collection. I am a reluctant owner of two Glocks, neither of which I have actually shot yet, but in general I rarely buy polymer framed pistols. I understand polymer construction as a practical weight reducing and cost-cutting measures for police and military. However, I am not a member of either of these organizations, and the motives behind my firearms purchases are entirely different. I buy them for accuracy, beautiful design, and historical value, and neither of these are conducive to plastic. However, when an opportunity presented itself to buy an almost (perhaps, entirely) new PX4 Storm in 40S&W for a fraction of a wholesale price, I simply could not abstain. 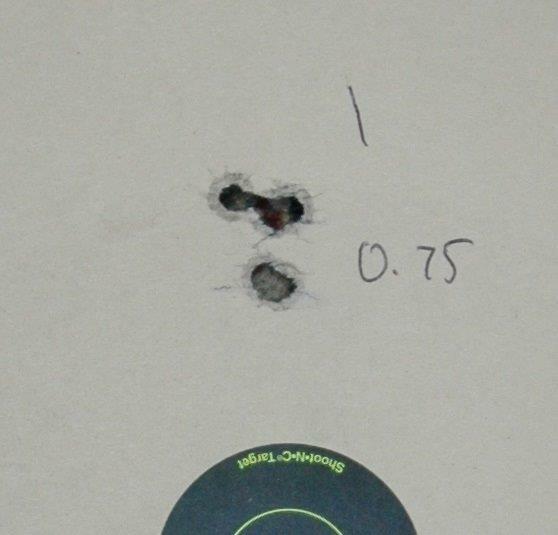 This is one of the reasons I love 40S&W - you can often buy guns in this caliber really, REALLY cheap. So a few weeks ago I have become a happy owner of a gun that no one in my practice have ever asked me about, or ordered. 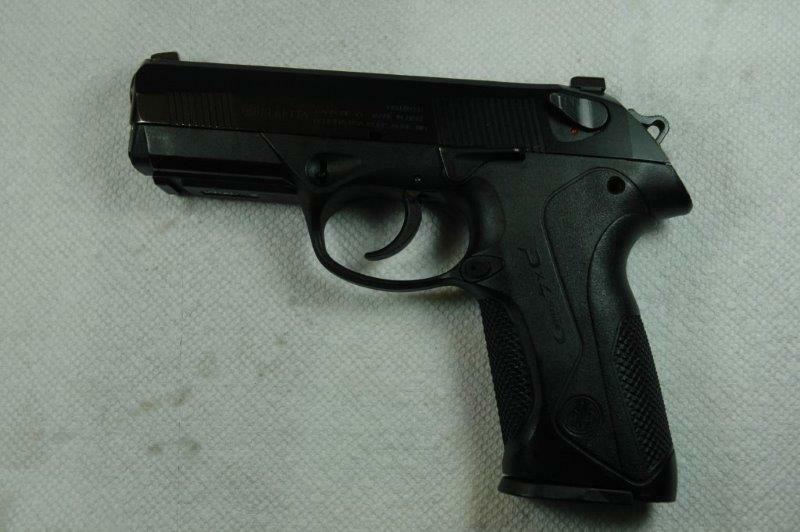 Right upfront, the gun looked typical Beretta: my amateurish photography does not convey it well, but the gun is actually pretty good looking. 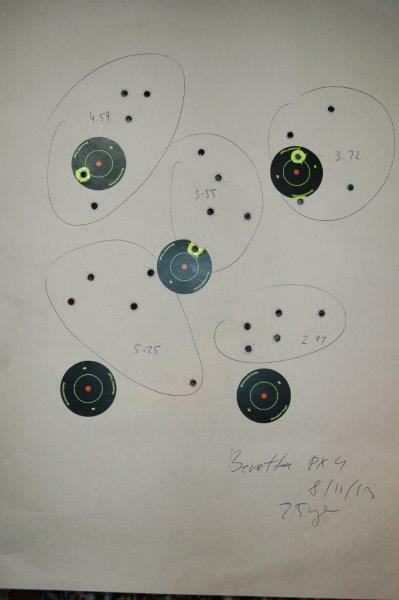 Without much ado, I took it out to the range, and this is where interesting things started happening. 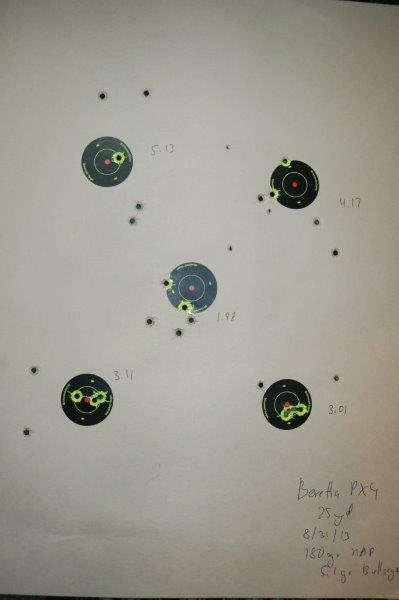 This is the first group of 5 shot at 25 yards. My first reaction was somewhere between WTF and wow. Unfortunately, this was only the first group. 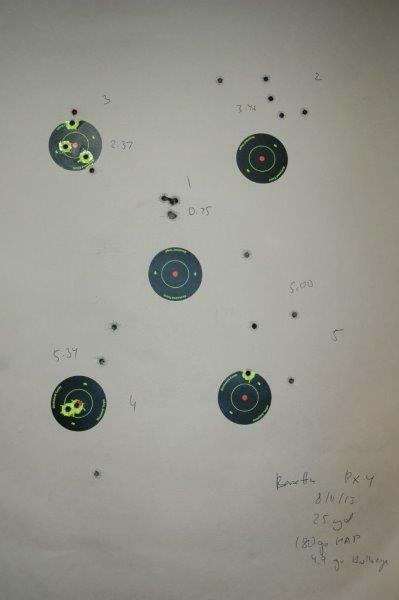 This is how the rest of the target looked, and the one shot right after it on the same day. Even though the results were not amazingly impressive, one thing made me wonder - it felt like I could predict the results of the shot before looking through the spotting scope. If I thought it would go well, it were right on target. If I thought "oh, crap", it would be a few inches away. 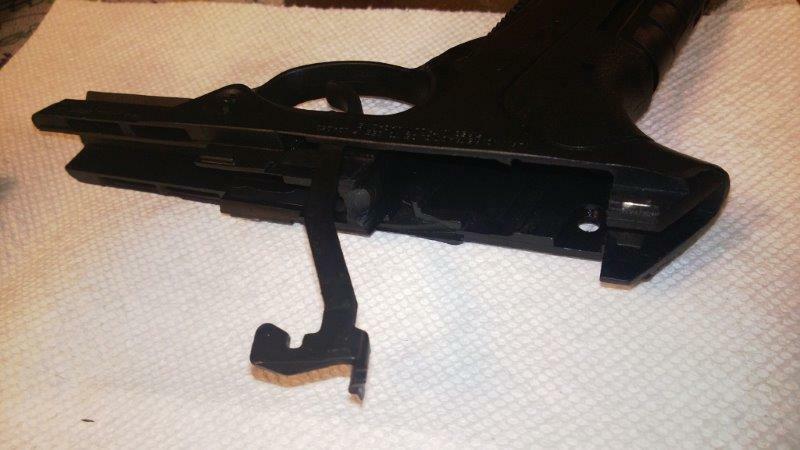 I am not usually the one to blame myself for the failures of a gun, but in this case I was just not too sure. 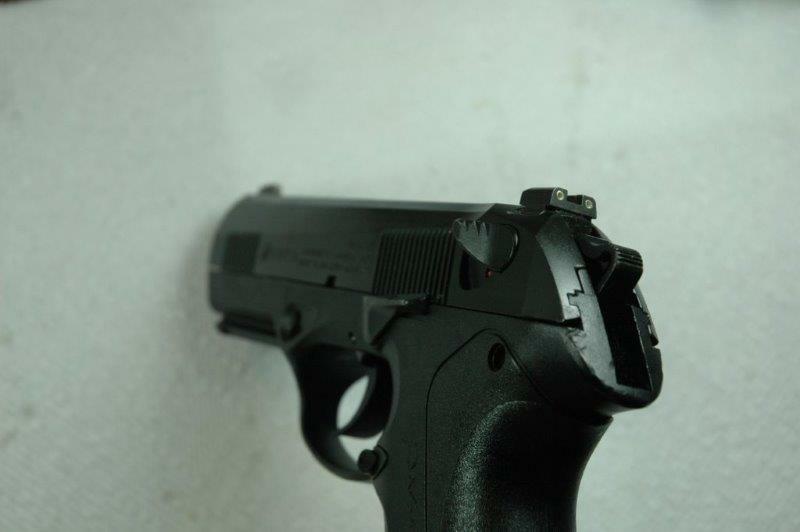 PX4 handles... peculiarly. Its frame weighs practically nothing. The weight is all concentrated in the heavy slide. I could almost say it is similar in this respect to HiPoints, except the grip is far more ergonomic. So when it recoils, it does so almost as a revolver, rotating in the hand upwards. So it requires a particular way of holding it, and when I though I controlled this motion well - which is to say, predictably - the shots were grouping amazingly well. 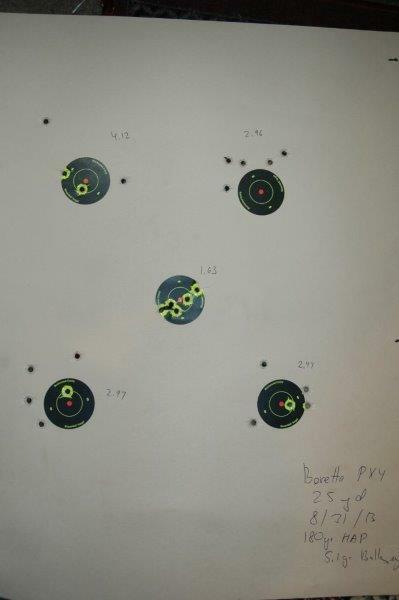 Here are a couple of targets from day 2, where I acquired more expertise in handling this gun. Internally, the gun is as interesting. 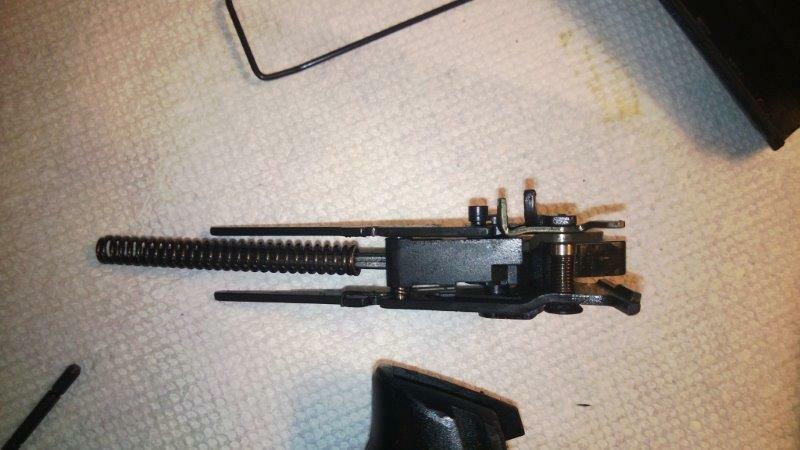 It is recoil operated, but instead of tilting the barrel when it locks, the barrel rotates. This may explain the accuracy of the pistol. 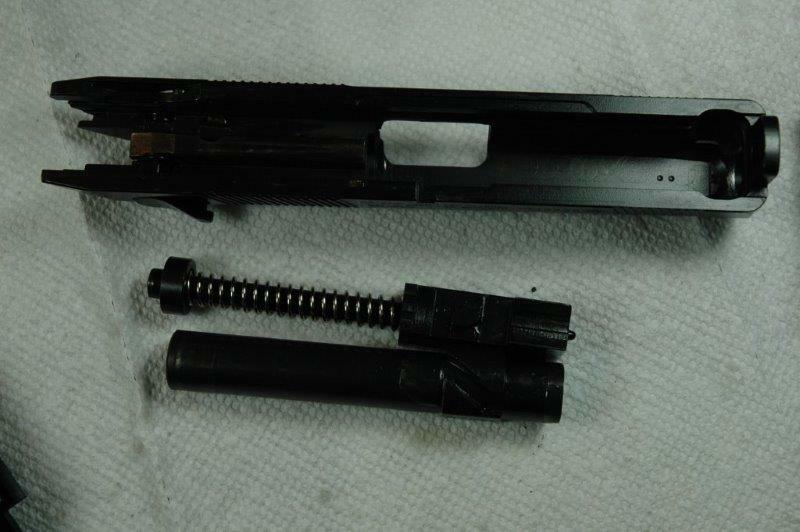 You can see the cutout on the barrel. 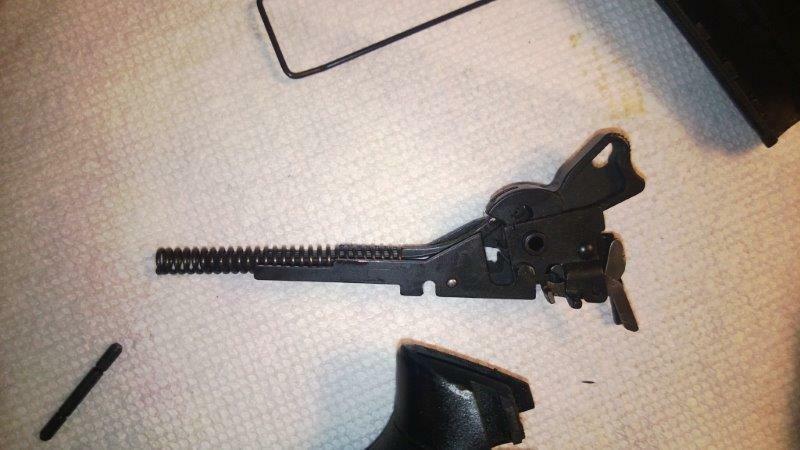 There is a notch on the box with the spring which goes into this cutout, and then the barrel recoils, it rotates it to unlock. 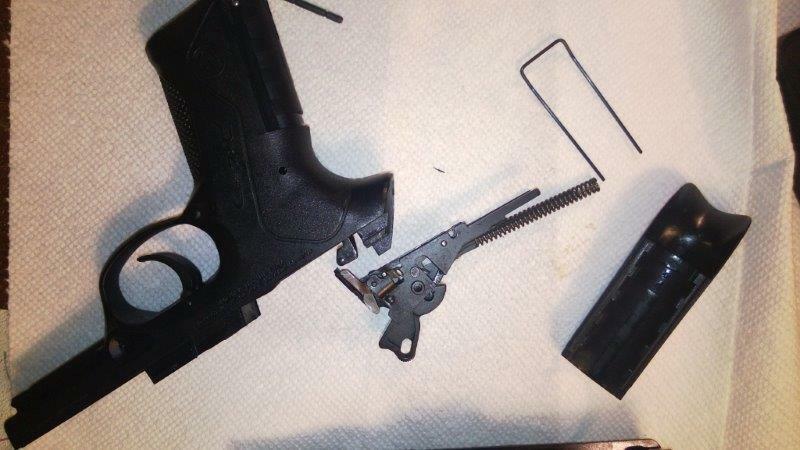 Inside the frame, there is a trigger group, a hammer unit, and not much else. The hammer unit is easy to remove. 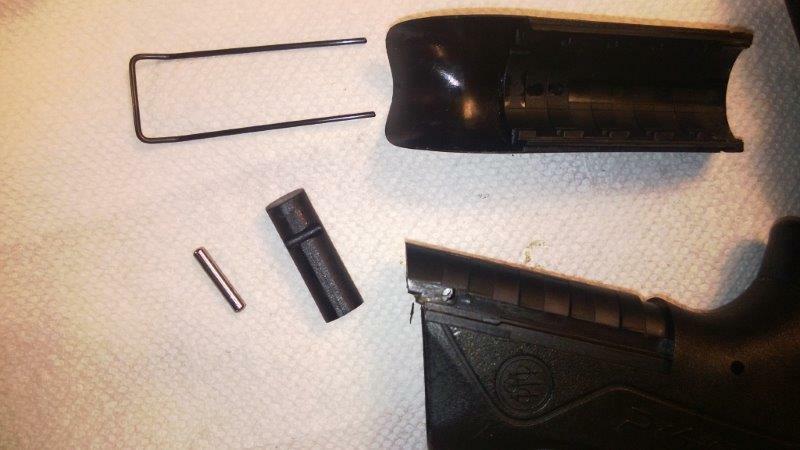 First, the backstrap needs to be taken off by pulling on the spring at the bottom of the magazine well. 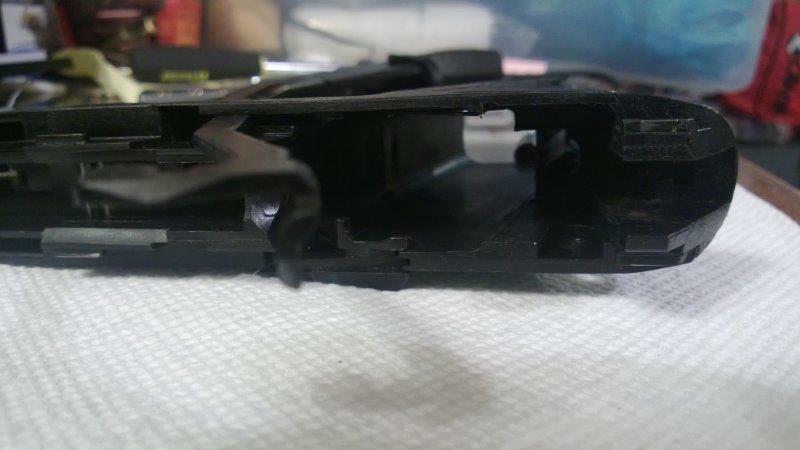 After the rectangular spring comes out, the backstrap unsnaps. This reveals two pins. The larger and shinier one at the bottom releases the mainspring stop, which decompresses it and makes the rest removable. Removing the second pin lets the hammer unit be pulled out. ...and the frame contains not much else that is interesting. This is the hammer unit. The reassembly is tricky. 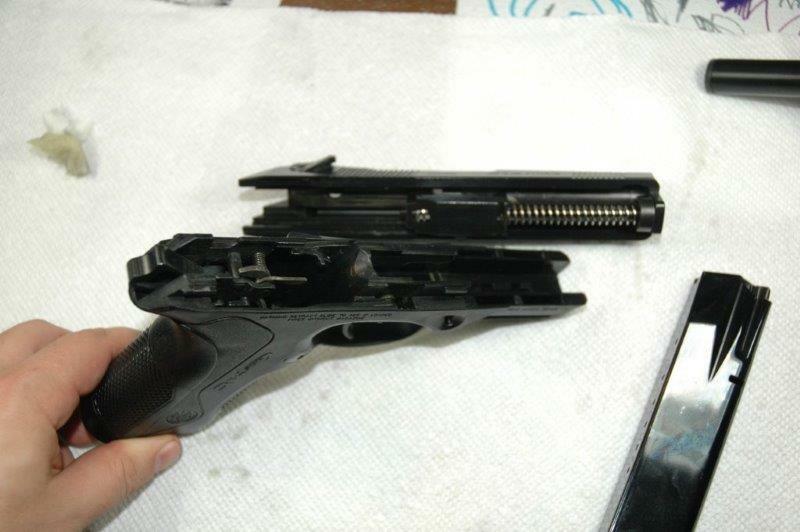 The hammer unit and the trigger pin must be positioned in a particular way inside the frame, and there is nothing online (or in a manual) that explains how to do it. 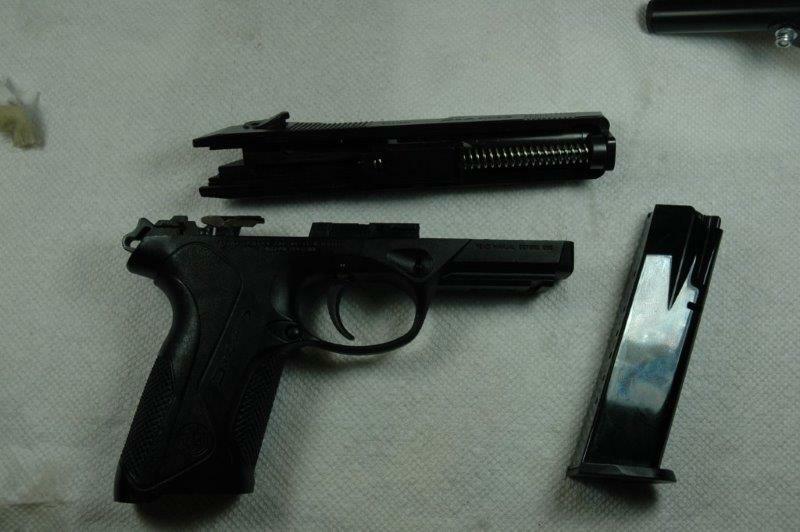 This is despite the fact that Beretta's selling point for PX4 is that the hammer unit can be removed by a user for cleaning. Removing, yes, but apparently not reinstalling :-). I finally accomplished this by worrying the trigger while gently pushing the hammer unit forward, but it took me a good part of an hour, and I can't promise that I can repeat this. What else is there to say? 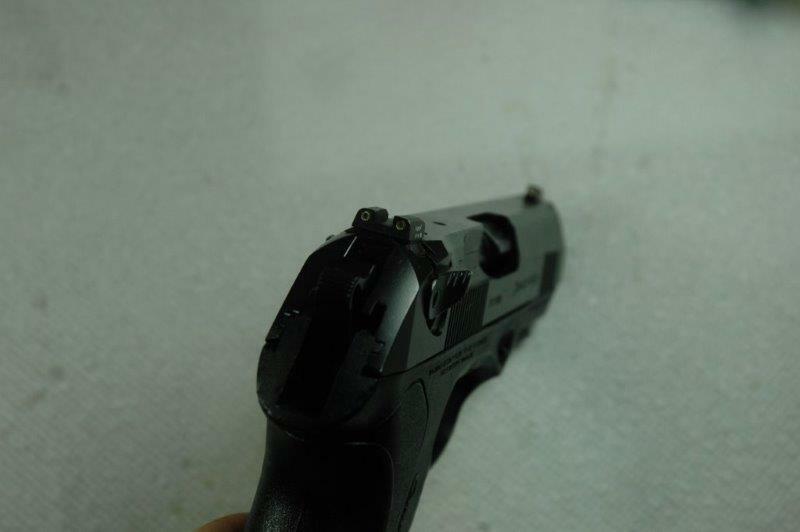 This particular gun came with Trijicon sights. The tritium in them have worn off, but the sights themselves were well-cut and easy to aim. 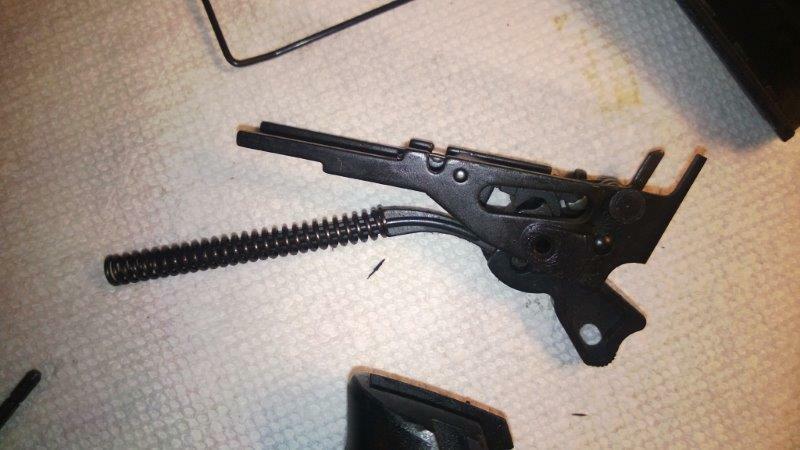 The trigger had a 5lb single action pull. The double action was tolerable - I would estimate it at 12lb, but my scale only goes to 8 so I could not measure it. So, in conclusion, an interesting pistol, and capable of amazing accuracy - if you can control it. 10/10, would buy again.